VIDEO: Meet The Bots That Beat The Obstacles : The Two-Way A robot unveiled by Disney researchers can drive up vertical surfaces. Other machines pushing boundaries: a bot that can jump on water without sinking and a bot that flies like a bird. 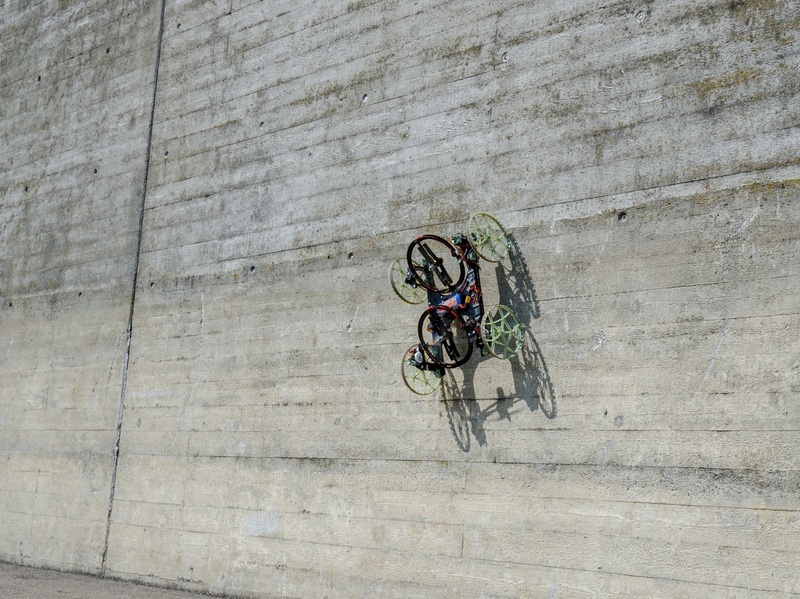 The wall-climbing robot in action. Meet VertiGo, a new four-wheeled robot that can easily roll from the ground onto a wall. "VertiGo extends the ability of robots to travel through urban and indoor environments," according to a team from Disney Research Zurich and Swiss university EDH Zurich that unveiled the four-wheeled machine on Wednesday. "One pair of wheels is steerable, and each propeller has two degrees of freedom for adjusting the direction of thrust. ... The use of propellers to provide thrust onto the wall ensures that the robot is able to traverse over indentations such as masonry. The choice of two propellers rather than one enables a floor-to-wall transition — thrust is applied both towards the wall using the rear propeller, and in an upward direction using the front propeller, resulting in a flip onto the wall." Disney Research member Paul Beardsley tells The Two-Way that the team is "pursuing possibilities for mobile robots in entertainment." He says "a wall-climbing robot could be used for visual effects, or could be physically styled in an entertaining way." Michael Bischoff of ETH adds that beyond entertainment, "things like industrial inspections could be possible with such a design." Walking on water is so 2,000 years ago. Scientists have built a robot that can jump on water. The U.S. military was testing a similar but larger four-legged robot from Boston Dynamics, which could carry about 400 pounds of supplies. However, Quartz reports that the military now says the robot would be too noisy for use on the front lines.